"This is an very simple recipe if you want to do something a bit different and unusual with a boneless leg of lamb. 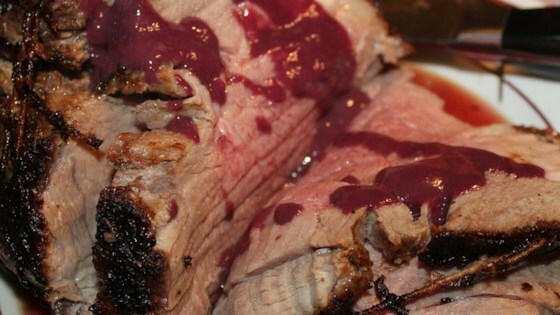 A boneless leg of lamb is marinated, then roasted and served with a tangy raspberry sauce." In the container of a blender or large food processor, combine the vegetable broth, raspberries, raspberry jam, and red wine vinegar. Puree until smooth. Pour into a large bowl, and set aside. Heat a nonstick skillet over medium-high heat. Sear the leg of lamb quickly on all sides, and remove from the pan. Pierce the meat every inch or so with the tines of a fork. Place into a bowl with the raspberry sauce. Cover, and refrigerate for at least 12 hours to marinate. Turn occasionally. Preheat the oven to 350 degrees F (175 degrees C). Remove the lamb from the marinade and pat dry. Place on a roasting rack in a roasting pan. Roast the lamb for 1 hour in the preheated oven, or until a meat thermometer inserted into the meat reads 140 degrees F (62 degrees C). Allow to stand for 10 to 15 minutes before carving. The temperature should go up by another 5 to 10 degrees while it rests for medium rare. If you like it more done, wait until it reaches 145 degrees F before removing from the oven. While the lamb is roasting, transfer the marinade to a saucepan. Bring to a boil, and add the rosemary. Boil over medium-high heat until the sauce has reduced and thickened slightly, about 10 minutes. Carve the lamb, and spoon sauce over it to serve. I am giving this the 5 star rating. I had my family tell me this could have been in a very fine restaurant! Was delicious! Not sure if I did something wrong or not, but this was awful...the sauce ended up tasting like raspberry ketchup...it did not thicken at all...will not be making this again.